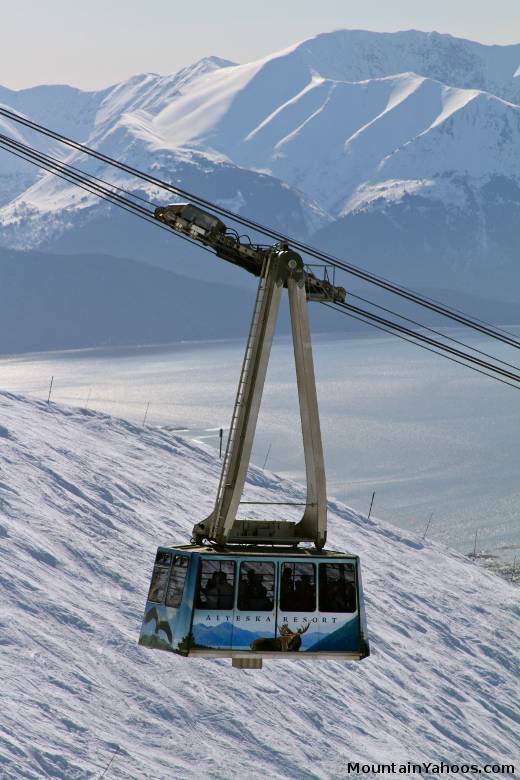 Alyeska is the largest resort in the state of Alaska and is located at the town of Girdwood on the Southwestern facing coast of Alaska, twenty seven miles from the city of Anchorage. The scenery is spectacular on the drive up to the mountain as well as the views from on the mountain. The local mountain ranges, forests and surrounding ocean are a breathtaking combination. 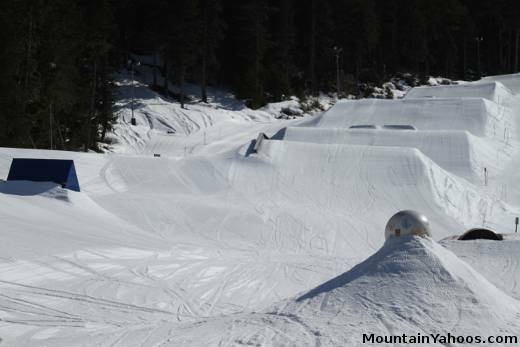 Although the mountain is relatively low in elevation, there is no shortage of snow at this latitude. 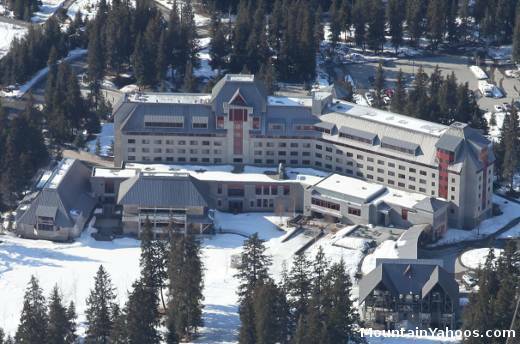 The upper elevations receive on average 650 inches of snow a year at the summit and receiving 512 inches of snow a year at mid-mountain. The low elevation does allow one to catch one's breath the first day out if traveling from a residence at a lower elevation. 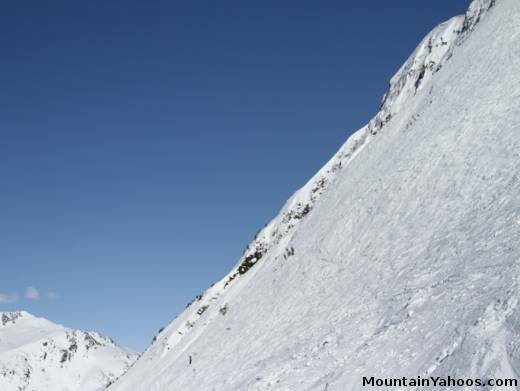 Alyeska is considered to be a challenging mountain with a large percentage of expert runs. As with many mountains, the easy runs are at the bottom. 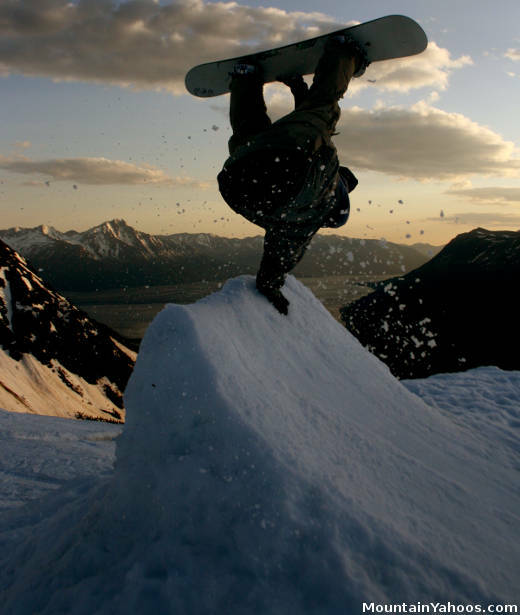 The terrain becomes steeper and more challenging as one rises in elevation. 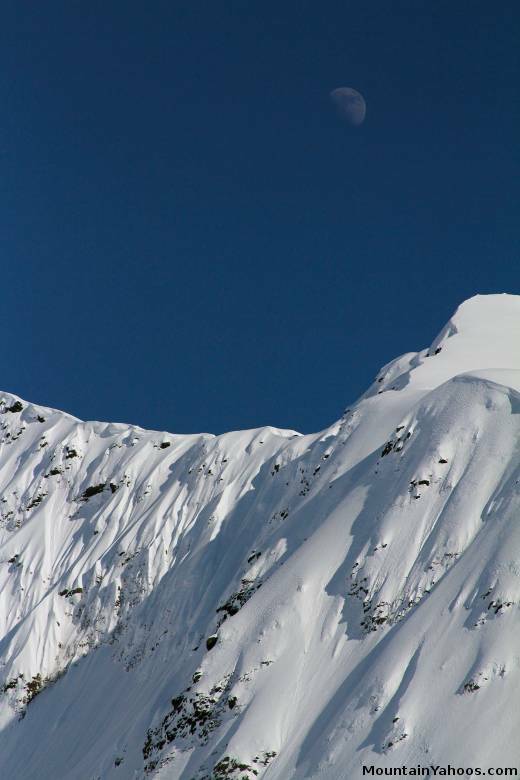 With only eleven percent of Alyeska's terrain dedicated to the beginner one may think that the beginner is ignored but Alyeska has two magic carpet lifts for the tots and new beginners with very open terrain. 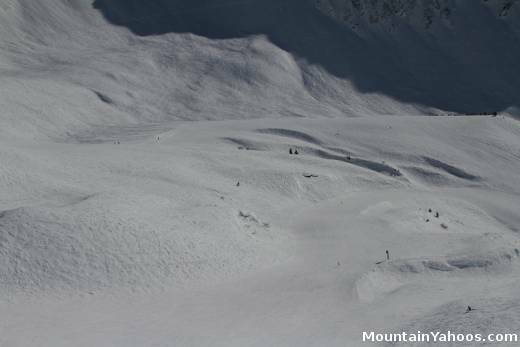 Intermediate "Blue" run: Upper Bowl "Silvertip Face"
Wide open glacial bowl ski runs are accommodating to the beginner and intermediate skiers. Chair lift four can take you to chair six for some wide open terrain in "Upper Bowl" or ski the blues and blacks accessible by four. There is a ridiculous amount of hike-able in-bound extreme terrain. The problem of course is that it is not easy to hike it but it waits for those dare to take it on. While Headwall stares at you like a temptation, there is really no easy way up and it's often closed anyway. The only consolation is that the summit altitude is low enough so you won't require a third lung. 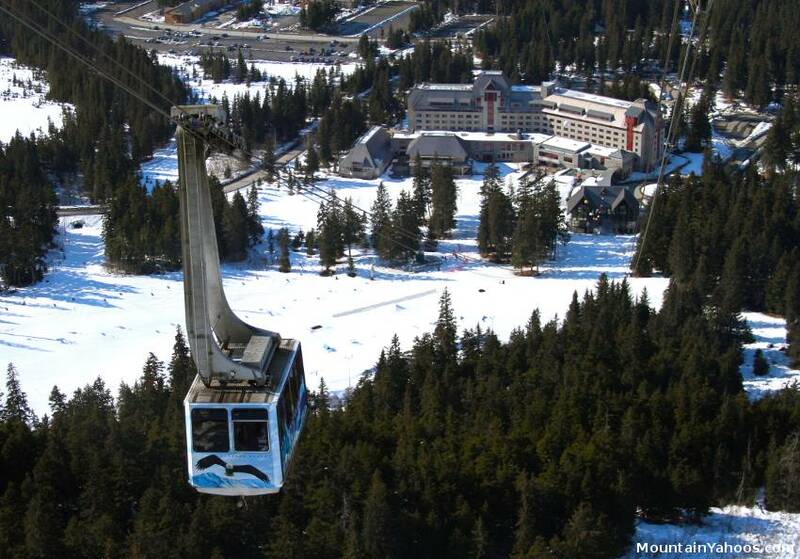 The prime, lift accessible, advanced terrain is off of chair 1 and the tram on "North Face". Advanced terrain through the trees and natural rock formations. The tree areas are often marked as closed. 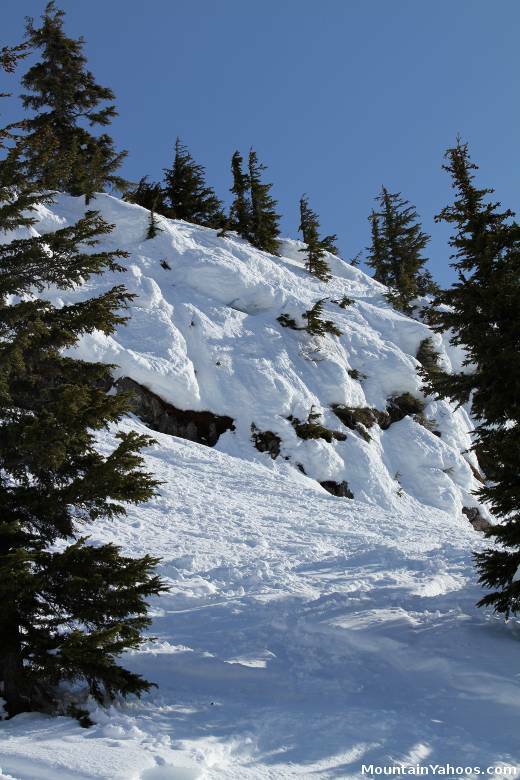 The best tree skiing is on North Face (not always open due to avalanche danger). 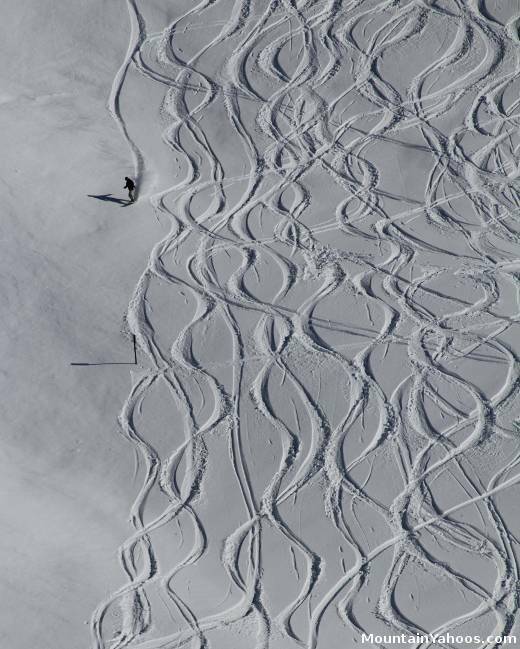 Moguls require many skiers to form turns on the same terrain over and over again. 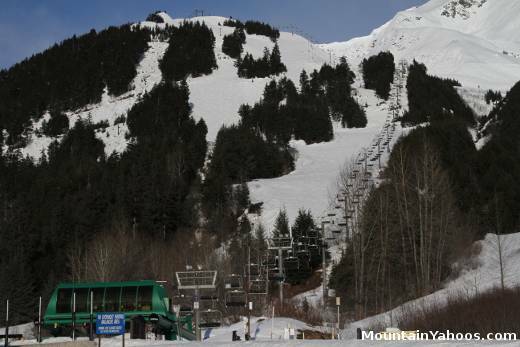 Alyeska is so open and vast with so few skiers that few moguls are formed before another snow dump resets the terrain. If you must look, try in between "Trampline" and "Gail's Gully" under Chair 6. Chilkoots Knoll and Headwall are the only reasonable hike accessible areas. Note that the boundary is enforced. Stay in-bounds. 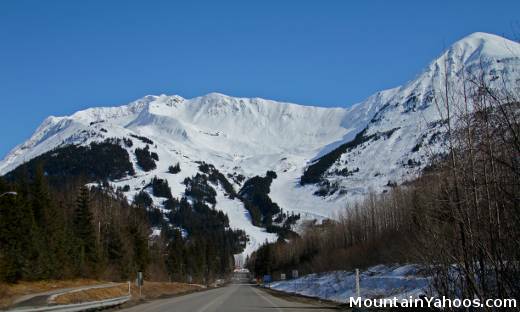 Outside of the Alyeska resort one can hike terrain down the road just past Girdwood (pick a mountain). 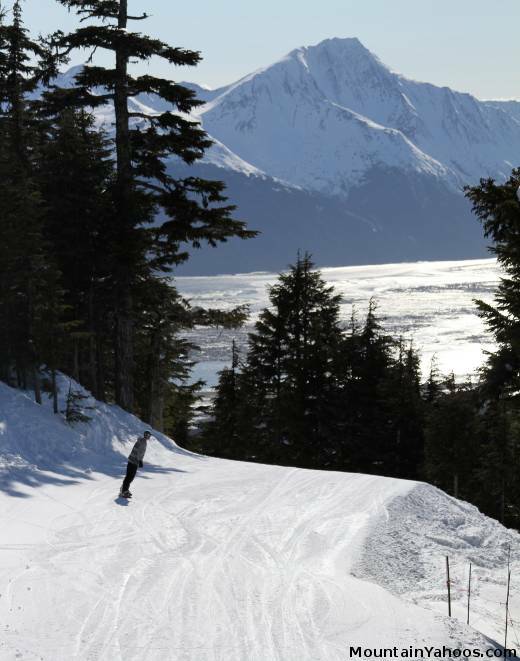 Turnagain Arm and Valley have terrain just like Alyeska and will most likely already have skin tracks. 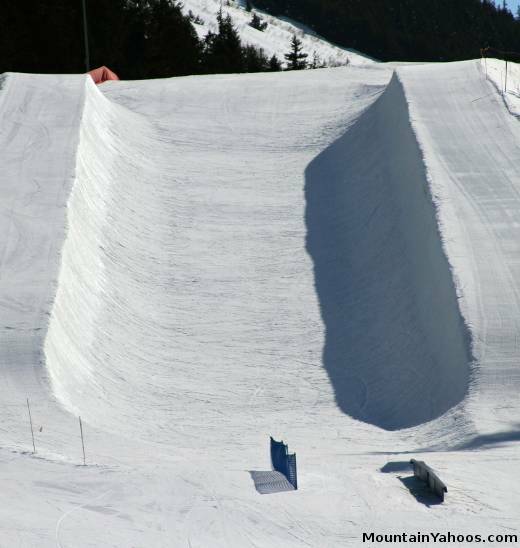 It is very dangerous if you are not familiar with the snow conditions and it seems that people die each year in a slide. 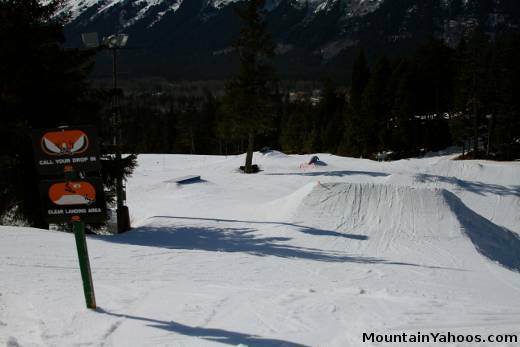 Terrain park: "Pump Station 3"
Glacier Bowl is the site of the Alyeska summer camp. 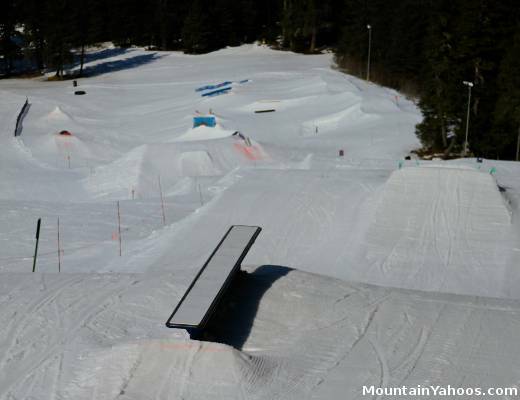 All of the park features are relocated to the bowl area for long days of riding (remember it's the land of the midnight sun). 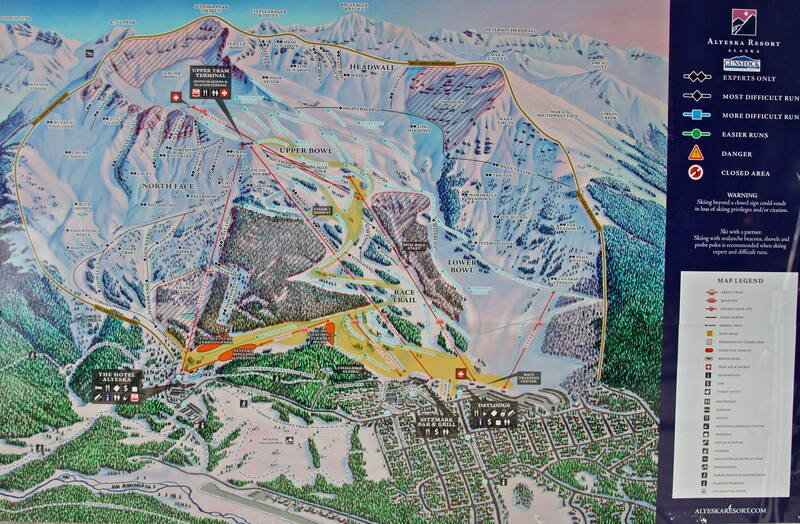 There are two base areas, one is "The Hotel Alyeska" at the foot of the tram and chair 7 while the other is the "Day Lodge" and Sitzmark Bar & Grill at the foot of Chair 1, Chair 4 and Tanaka lifts. Basic mountain supplies are available in the hotel shops.